MCCORMICK vs. MANNY & Co.—In December, 1854, C. H. McCormick brought a suit in the Circuit Court of the United States for the Northern District of Illinois, against John H. Manny and his partners, charging that they were building Reaping Machines that infringed his patent of 1845 for the divider and the reel post, and his patent of 1847 for the raker's-seat and reel. The case was elaborately argued before the Circuit Court in September, 1850, and in January, 1857. 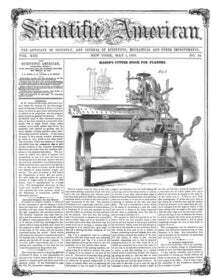 Judge McLean delivered the opinion of the Court, deciding that Manny & Co.'s machine did not infringe on McCormick's patents as charged, but, on the contrary, was an improvement invented and patented by John A. Manny, upon reaping machines which existed prior to McCormick's. From this decision McCormick appealed to the Supreme Court, and this final appellate tribunal rendered judgment on the 22d instant, affirming Judge McLean's decision and dismissing McCormick's bill with costs. The case was argued for Manny & Co. by E. M. Stanton and George Harding, and for McCormick by E. N. Dickerson. A synopsis of the decision will be given next week. At the opening of a new street in Parts lately, M. Dubose's electric light was employed with great success, perfectly illuminating the street, and shedding a beam of brilliant white , for a great distance.